Seattle Times food writer Bethany Jean Clement and cocktail expert Tan Vinh went to Renee Erickson's Deep Dive and Willmott's Ghost to find out how the vision of a favorite Seattle restaurateur looks refracted by New Seattle’s Amazon cash. 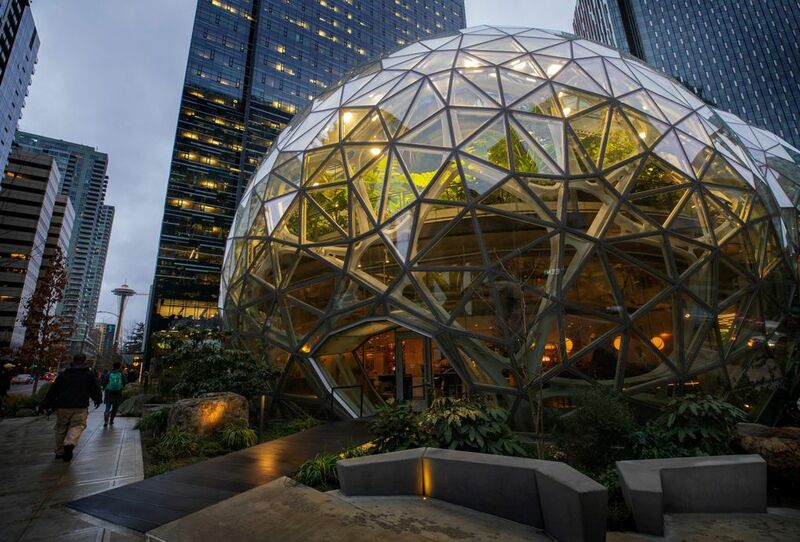 What happens when one of Seattle’s very best chefs gets lodged in Jeff Bezos’ Amazon Spheres? Chef Erickson, for her part, has long been emblematic of a very Pacific Northwest sense of place, a culinary style that reveres what’s naturally here. She grew up in Woodinville when that land not far from Seattle still had strawberry fields, her family fishing and clamming and feasting on Dungeness crab at their little cabin on Puget Sound. Her restaurants have been key in defining a regional cuisine, elevating local ingredients in settings reflecting her airy, graceful, endlessly pleasant French-leaning style. And while Erickson’s always been upscale, it’s been a gentle, unpretentious tilt, entirely embraceable by the jeans-and-Gortex old Seattle style. But as Seattle has changed at a head-spinning pace, so has Erickson’s world. Her gradual expansion to several restaurants — The Walrus and the Carpenter standing as the most famous — went ballistic last year with the acquisition of nine more, including a very off-Erickson-brand chain of local hamburger spots, along with the opening of a branch of her high-end doughnut shop in L.A. Some would say it doesn’t feel very Renee. 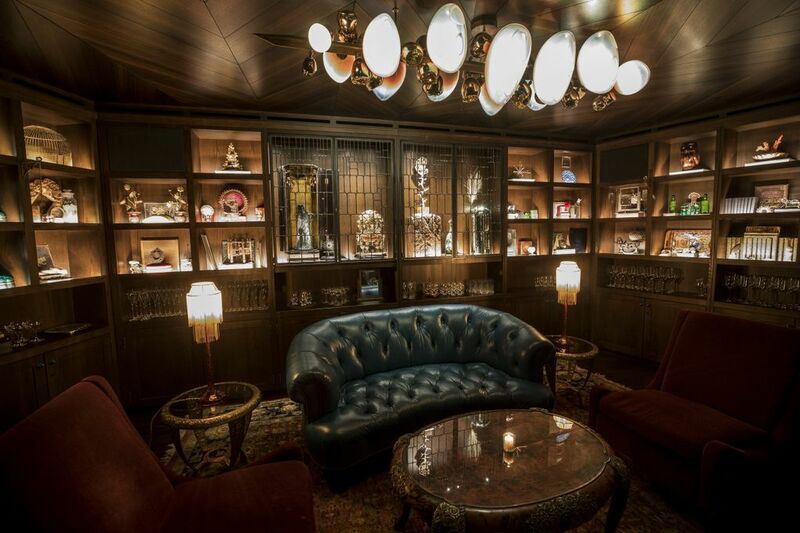 Now comes her Deep Dive, the darkly opulent bar lodged in the undercarriage of the Spheres, resembling nothing she’s done before — and offering a list of $17 cocktails and an $18 hot dog. Topside, just up on the corner, her restaurant Willmott’s Ghost more closely resembles classic Erickson, light-filled with white marble accents yet filtered through a futuristic lens — including a hanger steak futuristically priced at $55. How does it all work out, this new vision from a Seattle restaurant hero, refracted by the facets of New Seattle’s Amazon cash? Seattle Times food writer Bethany Jean Clement and cocktail expert Tan Vinh went to find out. 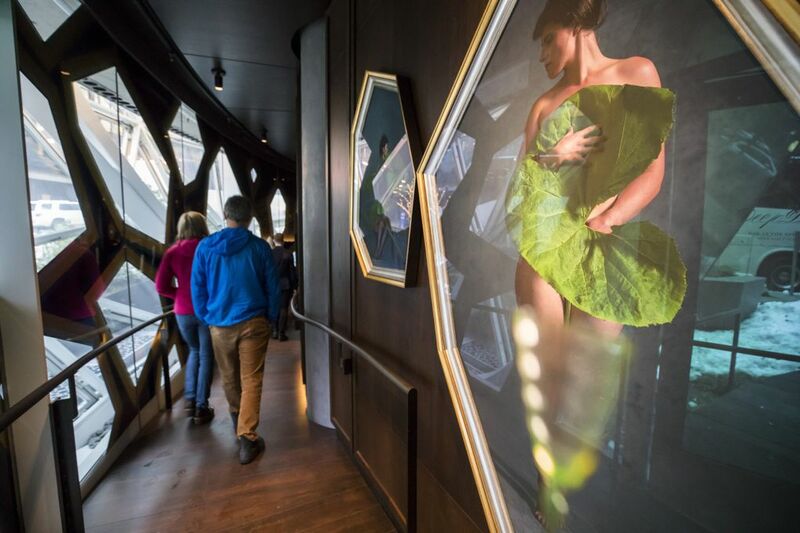 Tan: Deep Dive falls under a nightlife category that’s quintessentially New Seattle: an exclusive, high-end bar with a dress code (“Please no athletic or overly casual attire”). 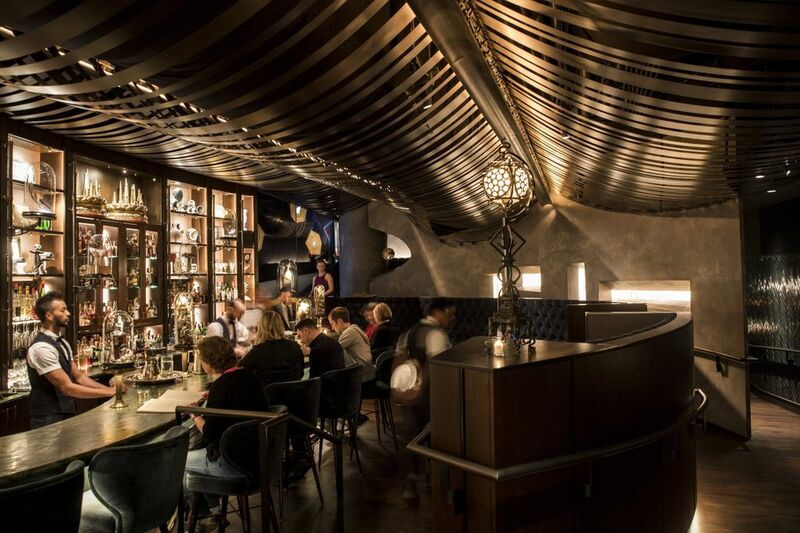 The hush-hush subterranean spot looks like an homage to the big-money hotel bars in Manhattan of yesteryear. Just going by the aesthetic, I could guess which cocktails would appear before even cracking the 20-page, leather-bound drink menu. 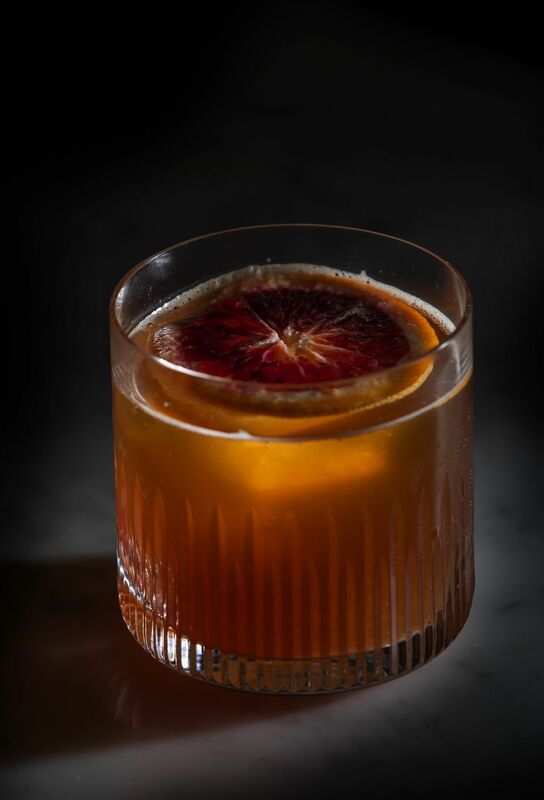 The list reads like a roll call of all the trendy drinks around the East Village in the past 10 years from renowned speakeasies like PDT and Death & Co. The original cocktails steer toward the boozy side — not many vodka concoctions. 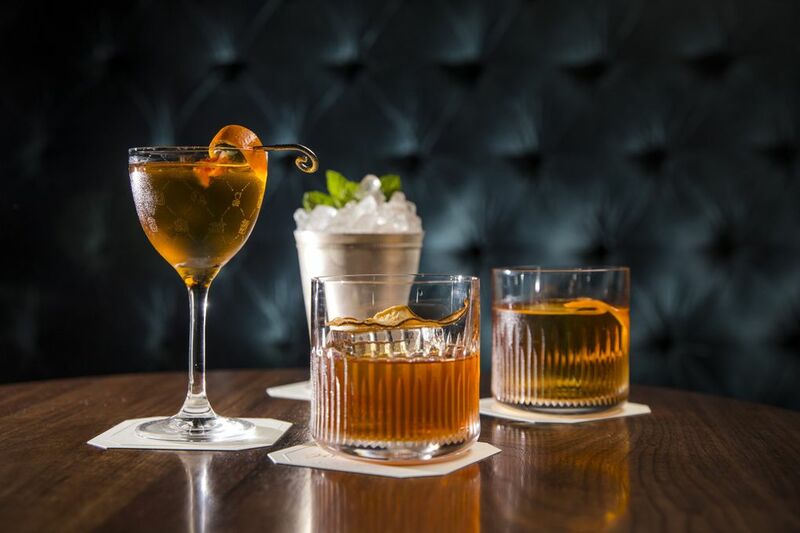 Many riff on Manhattans and old fashioneds. 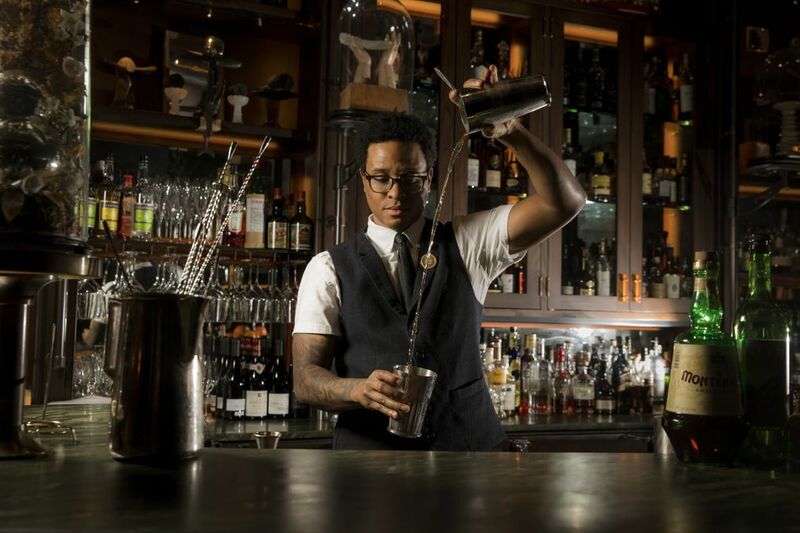 Head bartender Jermaine Whitehead plays with different ingredients and pairings: chai, strawberry-infused aquavit, rosemary, allspice, cardamom. Rum cocktails taste more like whiskey tipples instead of the stereotypical beach drinks. The Choose Your Own Adventure cocktail, a Japanese whisky paired with pear, is accented with cumin for a savory spin. In a city filled with copycat bartenders, I like that Whitehead takes familiar drinks in an unexpected direction. Bethany: No one goes to Deep Dive to eat — the cocktails, at $20-plus with tax and tip, may seem like enough of a seat-rental fee. But eat we did, and an immersion into the menu here was not always a buoying experience. Uni profiteroles ($7 each), presented with a promise that they were “bursting with uni,” were abjectly dry, hard-edged pastry puffs, mine with only the barest hint of a brackish, thin cream to be found inside. Caviar toast — $10 for two, made with big, salty salmon roe to fit that price point — sounded luxe, but the fingers of brioche were unmistakably stale. We loved a thick, almost fluffy squash soup ($9), its flavor warmed with ras el hanout and hazelnuts — the kind of thing that’s easy to make well, but hard to make great. An order of beef tartare ($16) looked like a flower, with house-made potato chips arrayed around it; urfa biber and jalapeño brine turned out to be smart twists, adding a little heat and acidity, but the meat’s coarse grind made for an unsettling slick texture and some very chewy bites. A Dungeness crab tartine ($20) had only crab-shreds, no pieces, and ended up tasting a little too much like tuna salad. Then there was the $18 hot dog. 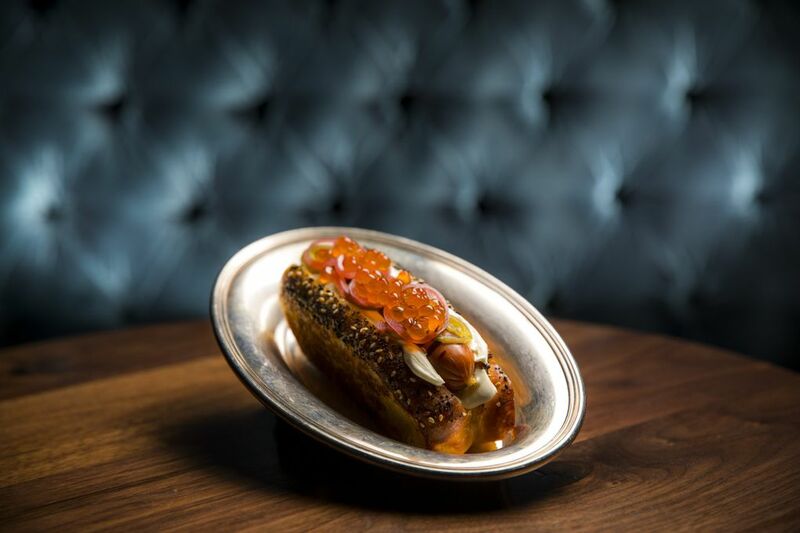 Clearly meant as tech-bro bait, its overcomplications — a richie-rich Seattle dog, with whipped cream cheese, pickled jalapeños and red onions, topped with salmon roe — lost charm after a couple flavor-overload bites. The format also made any less-than-terribly-messy eating impossible, with all the toppings pulling off at once. But Tan felt differently. 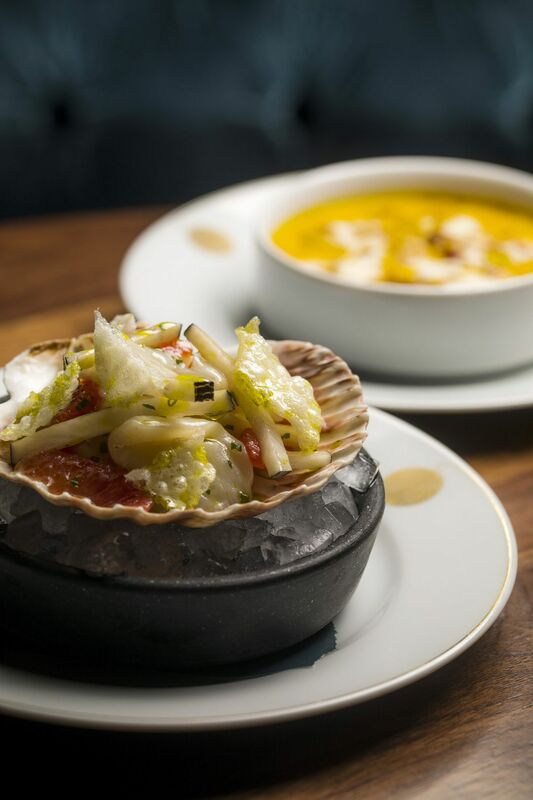 Tan: I like the play on this lowbrow drunken food, a smoky, snappy bite with a medley of tart, salty and spicy flavors with briny pops from the roe. What’s not to love? The rest of the bar food was boring. The brioche on the caviar toast tasted like it was two days old. The shell of the uni profiterole tasted three days old. Bethany: Even though its manly library vibe is so recently installed, there’s something about Deep Dive itself that also lacks freshness. No matter how full it is — and it’s almost always full — the energy in the oddly shaped room never sparks. It’s meant to feel glamorous, with curios on shelves and under specially lit bell jars, but ends up stage-set-like, all artifice and no heart. Tan: It’s missing that warm glow of other Erickson projects. This feels more like her dark alter ego — and, in fact, the “curator” of the space is Curtis Steiner, owner of the eponymous Ballard home store. The metal grooves overhead look like ribs. I see mangled fingers and mannequin hand displays. I feel I’m in the bowels of a sea creature. It all feels so Jonah-like. Bethany: And as luxurious as Deep Dive is obviously meant to be, they’re not necessarily running a very tight ship. Your pretty velvet chair may have a stain on the seat, or a back so loose, it seems on the verge of collapse. Some staff overdo it with forced, interruptive banter. They may take your coat and have it waiting when you leave, but then there’s no one manning the velvet rope; with a shrug and a smile, another patron unhooks it for you. GOING FROM DEEP DIVE to Willmott’s Ghost is like coming up for air. 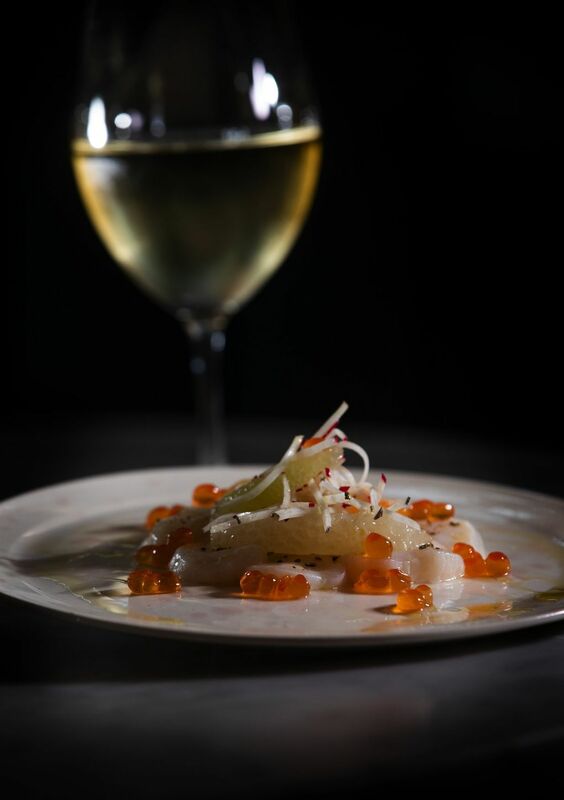 If the bar seems sunken — located, somehow, nowhere — the restaurant feels site-specific, with Erickson’s signature lightness perfect for a place situated inside what feels like a fancy aquarium. 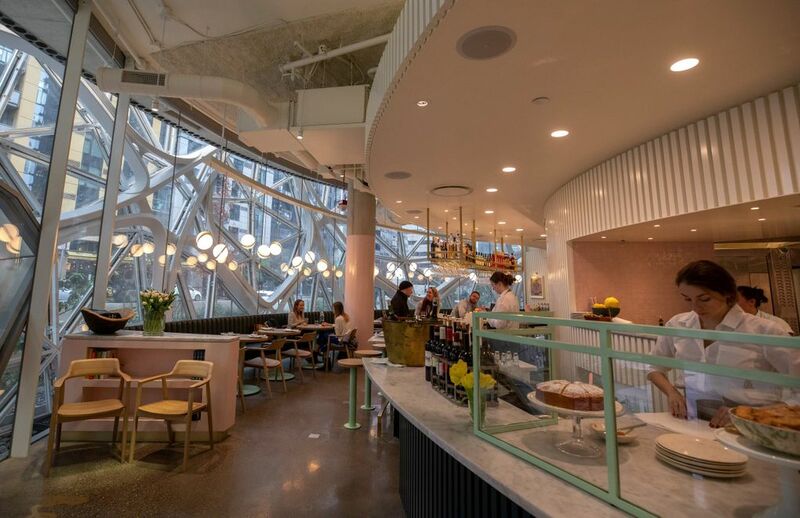 While the setup is dinerlike, the money spent is evident: deep-sea-blue leather upholstery for booths and banquette, gorgeous custom-made brass bar racks, a 3D striped wall. The open kitchen looks like an incredibly pleasant, elegant place to cook, while the bathrooms are prettier than rooms containing toilets have any right to be. The diners tend toward pretty, too: mostly female, possessed of that kind of effortless not-from-around-here style that costs a lot, more at home in Silver Lake than Green Lake. Tan: An aquarium, indeed. I half-expect a couple of manatees flapping behind the glass. But I gotta say, during Seattle’s recent Snowpocalypse, the Spheres looked like surreal snow globes, like some interactive art installation put on by the Olympic Sculpture Park. Other days, I just feel like I’m in a fishbowl. Bethany: The Willmott’s Ghost effect is sort of “Renee Erickson: An Underwater Odyssey” — her aesthetic but more streamlined, sleeker (except, maybe, the name, which with signature whimsy is an old-timey horticultural reference). The menu also reads like Erickson translated into Amazonian. The majority of those workers’ demonstrated allergy to any culinary complication must be handled, and so Erickson changed lanes from her usual French-ish Pacific Northwest to a Roman theme — thus friendly fried snacks like pillowy-instead-of-pasta-y gnocchi ($10) and straightforward, tempura-style fritto misto ($10). 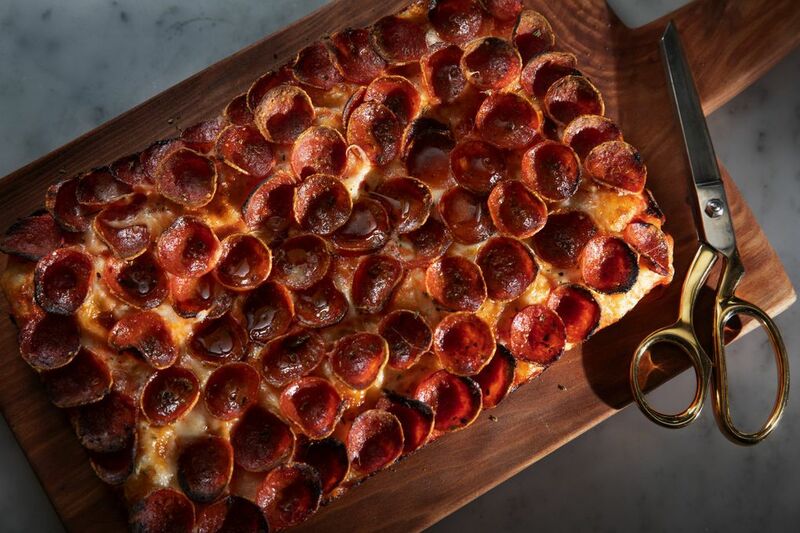 And there must be pizza: rectangular, thick pads of focaccia-style crust fancied up with the likes of olive tapenade. Ironically, the more upscale one we tried — mortadella and mozzarella with parmesan cream and orange zest ($23) — tasted spongy and dull compared to a happily greasier pepperoni one with good old tomato sauce and lovely caramelized edges ($15, and only on the happy-hour menu, but available all evening by request for around $17). 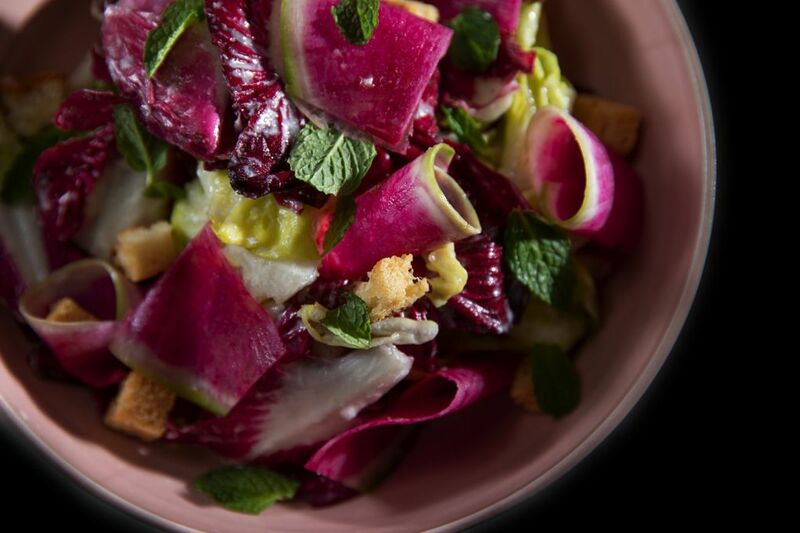 Tan: The spicy, crunchy chicories-and-radish salad ($13) looks like a purple Mother’s Day bouquet — almost too pretty to eat. Almost. I love that every leaf was coated with creamy, salty specks of parm and the bright hint of mint. I’ve had so many good variations of this salad in Portland, especially at Quaintrelle and Dame. It’s a mystery why it has never caught on around Seattle. Bethany: But another vegetable dish — roasted squash with chanterelles, walnuts and shavings of parmesan ($12) — was vastly overrich with butter, the squash mushily sweet, and both the mushrooms and some sage leaves overly oily-fried. Neither of us wanted to eat it. And both of the dinners we had at Willmott’s disappointingly mixed hits with misses, sometimes in the same dish. 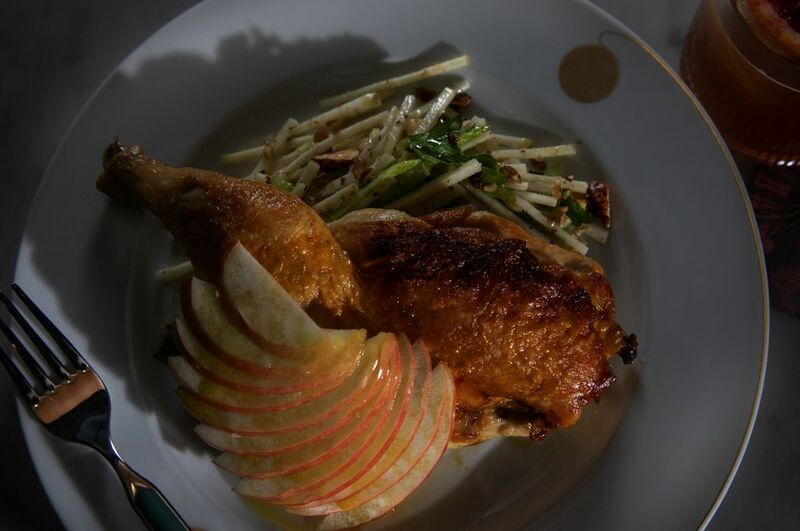 A half-chicken cooked under a brick got the bronzed-crisp skin that method confers at its best; ditto the light and dark meat both ideally done, and apple, celery, kohlrabi and almonds made a crunchy, bright counterpoint. But the chicken was dramatically oversalted in spots — and a $30 half-chicken coming out of a Renee Erickson kitchen ought to be flawless. Tan: The $55 hanger steak — too thick for this normally cheap cut, and supposedly medium-rare — was cold, bloody and gristly. (The server said this 16-ounce serving of meat was “probably” enough to serve two, but we didn’t manage to chew through very much of it.) The sides were no better: gummy polenta and greens as bitter as Fernet. And the spot prawn ($18) that should have been firm and sweet instead was overworked: minced and mixed with pickled beets to a pasty glob. Bethany: Put that last dish under agree-to-disagree: I thought the sweet-and-sour little cubes of beet played nicely with the fresh, subtle raw prawn, with a smoky aioli adding a campfire-on-the-coast touch and fried burdock threads bringing crunch. Service at Willmott’s Ghost was commendable — quick and super-competent, they made the place more fun, though the consistent recommendations for the highest-priced wines by the glass felt like upselling, especially given our descriptions of what we wanted. AND IT WAS CONSISTENCY, overall, that our voyages into both Willmott’s Ghost and Deep Dive sadly lacked. That, and an ineffable feeling I might venture to call soul. 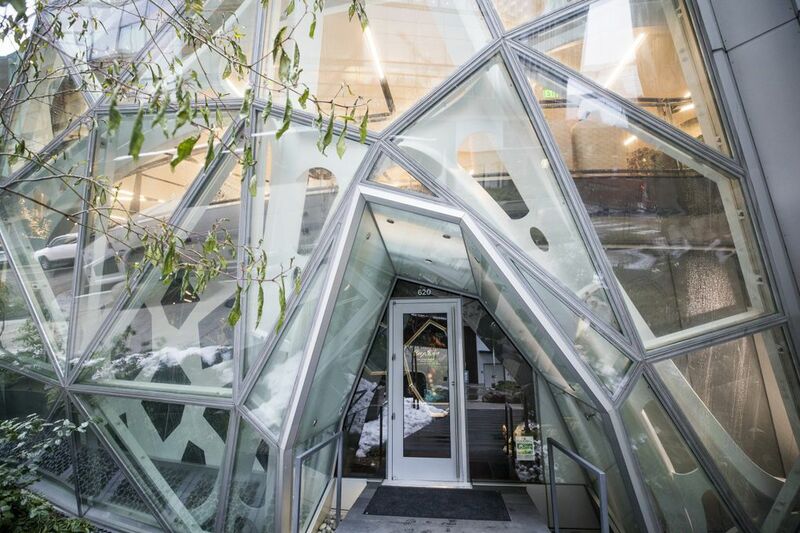 Tan: The belly-of-the-beast feel of Deep Dive serves as a metaphor for how I feel about this project: Erickson, who created such original restaurants as The Walrus and the Carpenter and The Whale Wins, got swallowed up by the leviathan that is Amazon. And Amazon has lured many big names. But these chef luminaries aren’t exactly doing their best work around campus. I didn’t think Amazon could reel in this James Beard-award winner. But along come these grand Spheres on the corner of Lenora and Seventh Avenue and — what do you know? — here she is. Bethany: Or, maybe, here she isn’t. Erickson’s delegates run these operations, and her Sea Creatures company seems to be showing the strain of overextension.